1. Preheat a small-sized skillet over medium-high heat. Mix the canola oil, peas, coriander and chilis in small-sized bowl; toss well to coat. It's easier to do this in a bowl than directly in the skillet since you want to make sure the blend gets evenly coated with the canola oil to ensure even roasting. Roast the blend in the skillet, stirring constantly, until the peas and coriander turn reddish brown, and the chilis blacken slightly, 1 to 2 minutes. Transfer the blend immediately to a plate to cool; the longer it remains in the hot skillet, the more burnt it will be. Once it's cool to the touch, grind it in a spice grinder (like a coffee grinder) or a mortar until its texture is like coarsely ground black pepper. 2. 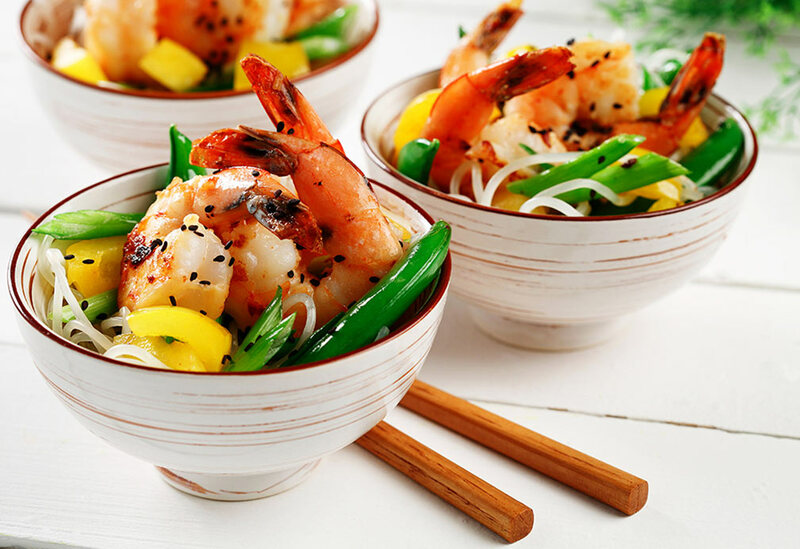 Transfer the spice mix along with the salt and shrimp to a medium-sized bowl; mix well. 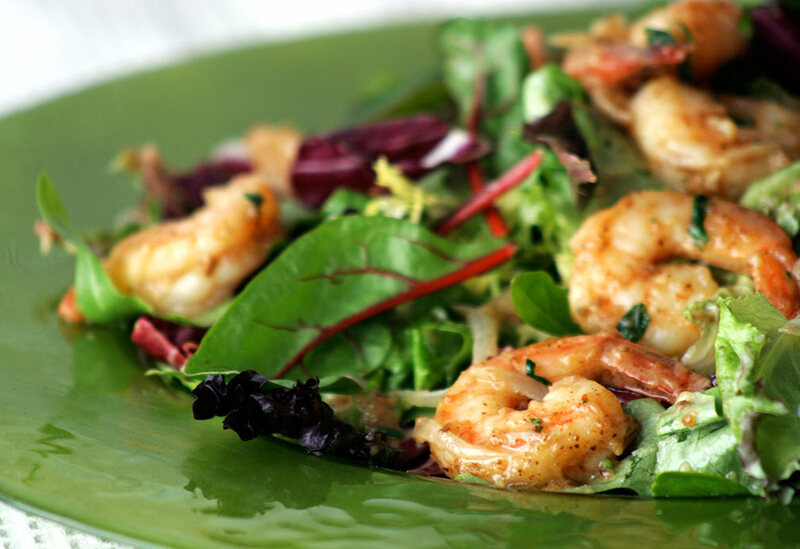 Refrigerate the shrimp at least 30 minutes, or up to 24 hours. 3. Place the raisins in a small-sized bowl and pour the boiling water over them. Cover the bowl and allow the raisins to reconstitute by softening and swelling, about 15 minutes; drain. 4. Place the raisins and all the remaining vinaigrette ingredients in a blender; puree, scraping the sides occasionally, until smooth. Makes about 3/4 cup (175 mL). 5. Heat the 2 Tbsp (30 mL) canola oil in a medium-sized skillet over medium-high heat. 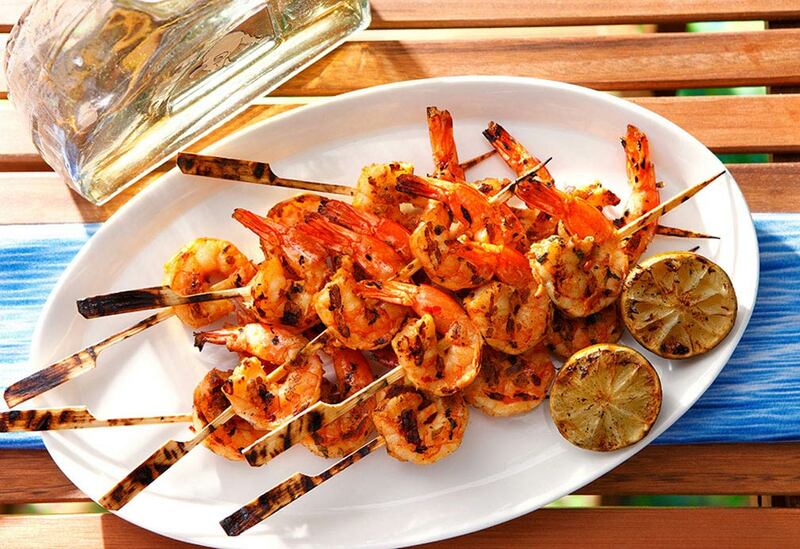 arrange the shrimp in a single layer. Add the shallots to the shrimp. Sear the shrimp until their underside turns orange-red in color, about 1 minute. flip the shrimp to sear the other side until orange-red in color, about 1 minute. The shallots will briefly brown while the shrimp cook. 6. Pour the coconut milk into the pan, which will instantly boil. Once the sauce thickens, about 1 minute, stir in the cilantro and turn off the heat. 7. Place the salad greens in a large mixing bowl. Stir in the vinaigrette well and pour it over the greens; toss to coat. 8. Pile the greens on a large serving plate. Spoon the shrimp and shallots, including the sauce over them; serve immediately. Tips: To toast cumin seeds, preheat a small-sized skillet over medium-high heat; toast the seeds, shaking the pan occasionally, until the seeds become reddish-brown and smell nutty, about 1 minute. The dressing will thicken as it sits. Thin it down with a little water as needed to a pourable consistency. If you wish, you can double the vinaigrette recipe and refrigerate the extra dressing for up to 2 weeks. Liberally brush it over a slab of salmon while grilling for a flavorful and quick meal. 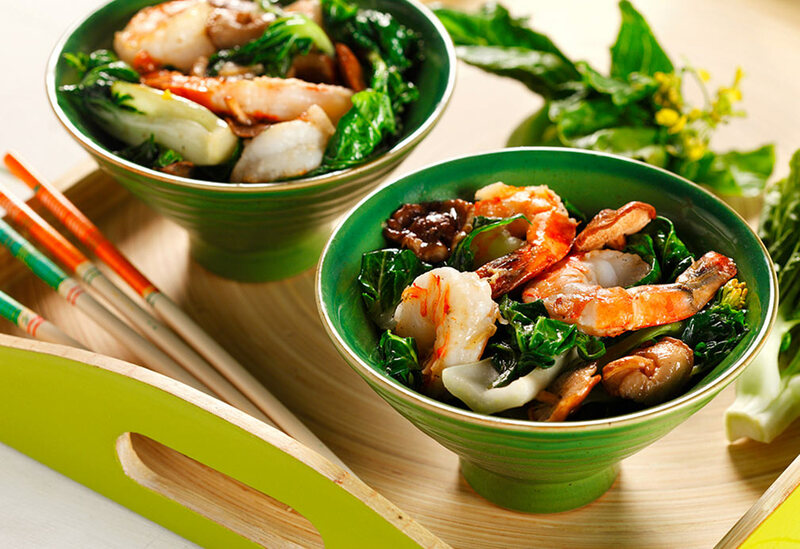 Stir-frying is a quick and healthy cooking method. Canola oils high smoke point works well and its neutral taste allows the flavor of the other foods to shine through.